I don’t know who updates the blackboard at my Kosama gym each week but I love her! I started thinking about excuses and how they can trap us into staying right where we are. 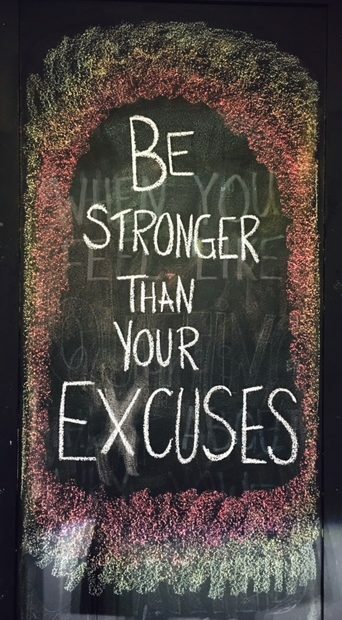 Have you given into any excuses lately? How do I know these? Because I’ve uses all of these before and then I went nowhere. How about making the rest of March the No Excuse Month? Seriously. When the thought creeps into your head, and excuses are very sneaky, say ‘Stop’. Then think of a way you can do it. There is always a way. If you don’t know, ask someone. One of the reasons I’ve done so many things in my business is because I did them before I fully knew how. Like: Speaking, giving teleclasses, designing handouts in Microsoft Publisher, writing a newsletter and blog, etc. Did they all succeed at first? Absolutely not! Did they eventually succeed? Yes. But, they would not have if I had let my excuses win and never started. What excuse will you kick to the curb today? !